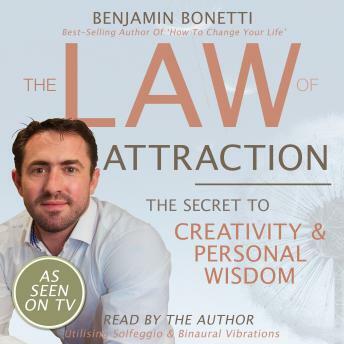 This re-release of Benjamin Bonetti’s 2008 Law of Attraction Audiobook presents both an introduction and powerful detailed explanation of ‘The Secrets’ surrounding The Law of Attraction. Divided into two audio sessions; an Introduction Into The Laws Of Attraction (57 minutes), and a specialised Law Of Attraction Meditation Audio (23 minutes), Benjamin utilises the ancient Solfeggio frequencies to balance your energy and vibrations. He also clearly explains the laws of manifestation and outlines the often missing aspects of The Laws of Attraction, while the vibrations assist in realigning you with the blue print of your true being. • 396 Hz – turning grief into joy, liberating guilt and fear. • 417 Hz – undoing situations and facilitating change. • 528 Hz – transformation and miracles, repairing DNA. • 639 Hz – relationship, connecting with spiritual family. • 741 Hz – expression/solutions, cleaning and solving. • 852 Hz – returning to spiritual order. He will guide and take you on a deeply relaxing journey to increase knowledge, absorb wisdom and ‘flip’ negative communication with the subconscious mind. You’ll open up the subconscious to a deeper understanding of what is happening to you, how you’re attracting it and uncover the reasons why you’re not attracting what you desire and deserve within the present moment. • You’ll be able to realign what is important to you. • You’ll be able to attract more of what you want. • You’ll be able to free up and release the past. • You’ll be able to ‘have’ in the present moment. For full effect it is recommended to use this Law of Attraction Audiobook session just before going to sleep at night or whenever required, using headphones. Note: The Law of Attraction Audiobook Series is not suitable for under 18’s. Do not use if you suffer from epilepsy, clinical depression or any other nervous or psychiatric conditions or whilst driving, exercising, operating machinery or taking alcohol or drugs. If in doubt, seek medical advice.